Career Chick Chat: Watch your "Brand"
﻿﻿﻿﻿ The internet is abuzz with all sorts of commentary about the photo of Katy Perry that hubbie Russell Brand posted on twitter earlier today. Headlines are screaming, Marital trouble for Russell-Katy?, Katy looks Perry different without make-up, and Russ posts pasty Katy on Twitter. As amusing as the headlines are - all the articles seem to agree on one thing. Katy probably isn't all that happy with Mr Brand at the moment. She's worked hard on her 'brand' over the last few years. And it doesn't include the "I've just got out of bed" look. There would have been big bucks and lots of effort in every wig, costume and look presented to the public. Whether for an on-stage appearance or a walk through Heathrow airport. Which is why the pundits are betting that all is not well in the Perry-Brand household in the short term. It's also a good reminder to all of us about the downside of social media. 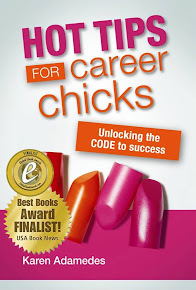 We may not have invested quite as much in stylists and image consultants as Katy but all Career Chicks have a brand (not the Russell variety). It's how we look and how we present ourselves to the world. It's that 'first impression' that we make that we want to say competent and capable. If you work hard at your work and at how you present yourself - you don't want it to come undone because of the indiscreet picture on facebook, twitter or anywhere else on the Net. I'm pretty sure Russell didn't mean any harm to Katy. With a bit of luck he loves her with and without makeup. But it serves as a reminder that others can post stuff and images about us that we would rather not be on display. One good trick is to set up a google alert for your name so that you get notified of anything on the Internet that Google finds about you. If you know you can deal with it! Personally, I'm quite pleased to find out that Katy is human after all. But I do hope that when I go to see her when she comes to Sydney in May that she does have the make-up, costumes and wigs on display. That's the California Career girl I want to see!